The Endless Deserts have been rediscovered after the Age of Chaos and now Sigmar has sent his Stormcast Eternals to the Tomb King's domain to seek an alliance. Will the desert revenants accept the offer or be a little more wary with the forces of order? Find out for yourself with the battleplan Kill the Messenger. Hot on the heels of the Time of War rules for The Endless Deserts I have my first battleplan for the supplement. This was interesting to create since I have only ever made a scenario one time before and it was for 40k and just for my friends and I to use. With Kill the Messenger I wanted to make something that was themed around the Tomb King's domain but could still be used by other forces. I feel like that is one of the big strengths of the AoS battleplans. They are all made with a particular battle in mind, but are written in a way that could work for any combination of forces. The idea for the scenario came from all of the little bits of lore I've read about Sigmar sending out emissaries to try and reestablish alliances with the other races and forces in the Mortal Realms. I thought about what would happen when Sigmar sends someone to try and negotiate with the proud and arrogant Tomb Kings. I imagined it wouldn't go to well at first. The Ambushers rule came from me wanting to represent the war statuary like the Ushabti springing to life around the Stormcast in the first few moments and cutting a few of them down. 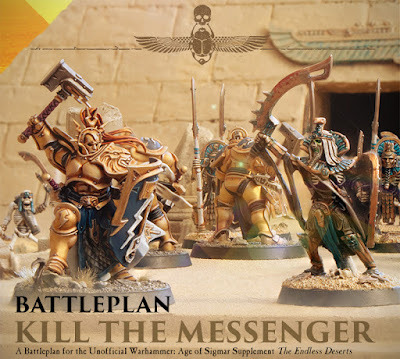 I reflected this in the Historical Fight blurb at the end that gives you my recommendations on how to further tailor this battleplan to represent the Stormcast's first encounter with the Tomb Kings. I will probably do at least one more battleplan and some lore to accompany all of it. I'm already thinking of story ideas for the Lord-Celestant I created for this scenario, Nihlus Tidalborne. I'm really enjoying making these supplements and I hope they are finding use amongst the community. You can find a low res version of the 4 page battleplan below that's optimized for web viewing. You can also download that version if you want but I have a link further down for the high res version that's best for printing. I want to thank the people in the community who helped me refine the rules in this just like with the Time of War ruleset. You can find the high resolution version here. This version is too large for web viewing, but perfect for downloading to print out. If you give this battleplan or the Time of War rules a try let me know how it goes.